We will pick you up early in the morning from your hotel in Taba then drive for approx. 1.5 hours with private modern jeep deep into the desert of Sinai near Nuwibaa city. Upon arrival to the entrance you will easily recognize the why it took this name. 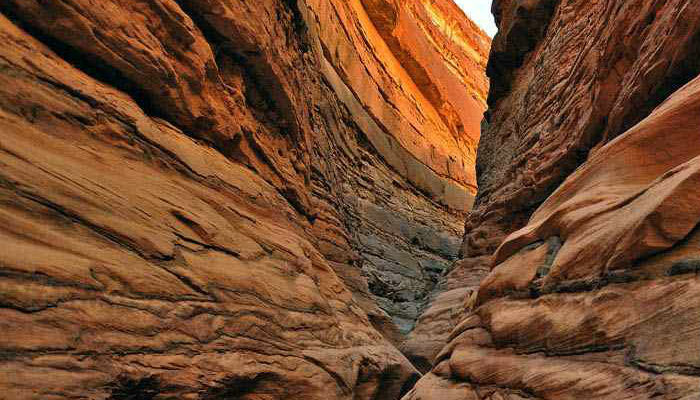 The canyon walls are high up to 40 meters, they are the top colorful and exotic rock formations in Sinai. It was made by the erosion of water interacting with both sandstone & limestone rocks. You will enjoy this easy hiking experience for 2 hours. Continue to Nuweiba passing by port occupying the entrance of the city, pay a visit to the Bedouin village, gaze the mountains of Saudi Arabia on the other side of Al Aqaba Gulf. Spend some free time for lunch and snorkeling then drive back to Taba.